New parameters make the 2014 edition of the Business Today-MDRA Best B-schools survey more rigorous. The MDRA team which worked on the B-school survey. Ever since Business Today started the Best B-schools survey in 1998, it has been our endeavour to constantly improve the methodology to select India's top management training institutes. This year too we have made some changes to the selection process that was already very exhaustive. Like last year, Business Today collaborated with Delhi-based market research firm Marketing & Development Research Associates (MDRA) to conduct the multi-stage survey. To begin with, an extensive desk review of MDRA's database and secondary research was conducted to select B-schools that offered two-year full-time management courses, were established at least five years ago, and churned out a minimum of three batches until the academic year ending in 2014. A list of more than 1,600 B-schools fulfilling the above criteria with their contact details was prepared. Separately, a list of B-schools offering one-year full-time Executive MBA or post-graduate programmes was also updated. We kept weightage to each parameter same as the previous year for the sake of consistency and comparability. However, at the sub-parameter level for "Selection Process, Governance and Establishment", the weights were re-distributed in the same proportion because of the inclusion of a new element - "Governance". Objective Survey: Based on these parameters and sub-parameters, we fine-tuned the objective questionnaire after incorporating the new elements. We then contacted all the B-schools that fulfilled the eligibility criteria to participate in the survey. Looking at the changing dynamics of business education in India, we included new parameters such as Mission, Vision and Governance of B-schools. Attributes that were compared primarily included availability of members of a school's governing board, availability of the academic advisory board, interaction happened among members in last one year and what significant commission and omission happened in the course curriculum and teaching methodology. Overall, the weightages of parameters were same. As many as 248 colleges across the country provided their objective data, compared with 213 last year. However, one of them submitted its data after the revised deadline and so was not evaluated. After receiving the objective data from institutes, we cross-checked the information provided by participating institutes carefully through available data and validation (past data, mandatory disclosure, telephonic check, asking confirmation through emails, website visits etc.). In case of insufficient or incorrect data submission by some institutes, they were contacted to provide complete and correct information. Experience-based Perceptual Survey: This module involved administering of questionnaire to a wide variety of respondents who know the B-schools from their experience. These respondents included final-year students, deans or directors, recruiters and industry professionals, and alumni with at least two years of work experience after leaving the institute but not more than five years to ensure relevancy. As soon as we started getting the data from the colleges, we started inviting deans, directors and the alumni seeking their opinion based on their experiences about the B-schools offering business education in India. Face-to-face interviews were conducted with the recruiters and final-year students to understand their perspective about colleges at national as well as zonal levels. A total of 1,301 respondents provided their opinion on top B-schools in 20 cities across all four zones of India. The respondents comprised 396 final-year students, 83 deans/directors, 514 alumni and 308 recruiters with rich experience. To ensure the maximum coverage of B-schools across states and zones, a national ranking and zonal rankings were prepared and the result was clubbed in a ratio of 75:25. Experiential Survey: To incorporate the actual contribution of B-schools to the careers of the students who graduated from those institutes, an experiential survey was conceptualized and conducted on each of the parameters and sub-parameters. The alumni from participating institutes were asked to rate their B-schools based on the contribution of the institutes to their career and life. Again, we interviewed only those alumni who had at least two years of work experience after leaving the institute but not more than five years to ensure relevancy. Physical Audits: Intense measures were taken during verifying and validating the objective data provided by the colleges. To authenticate any suspicious data, experienced researchers at MDRA carefully examined each and every aspect of the details provided by B-schools. To further verify the authenticity of the data submitted, the researchers visited 78 B-schools (50 out of the top 100) across the country. The irregularities were removed or corrected in the final objective data. Assigning Ranking: To give stakeholders more realistic, updated and accurate information about B-schools, MDRA collected and evaluated B-schools on the basis of current data, unlike last year when the evaluation was done on the basis of the previous years data. The rankings were assigned based on the combined scores of the perceptual survey, objective data and experiential scores. Based on feedback from experts and to make the ranking more logical and objective we have changed the scoring pattern of a few attributes such as accreditation, bank tie-ups, student-to-faculty ratio (only permanent faculty was considered) and student's attendance. Objective Data: Marks on each sub-parameter were calculated using the weightages that were suggested by a panel of experts. Thus, marks for every sub-parameter were arrived at and were then added to get marks for respective parameters. 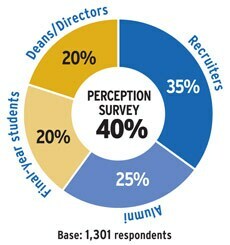 Perceptual Survey: Students, deans/directors, alumni and recruiters from the industry were identified as the primary stakeholders for the perceptual survey. The perceptual scores assigned by recruiters, alumni, deans/directors and final-year students carried weights of 35 per cent, 25 per cent, 20 per cent and 20 per cent, respectively. In addition, national and zonal ranking were given 75 per cent and 25 per cent weightages. Experiential Survey: The marks on each sub-parameter were calculated using the same weightages as in objective marks calculation. 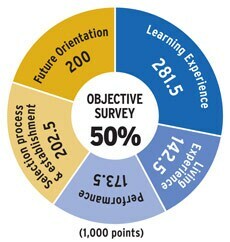 This experiential data was collected from alumni of the colleges that submitted their objective data. In a few cases where we did not receive alumni response about their alma-mater, colleges were assigned marks in proportion to their objective and perceptual score. To avoid any prejudice, the final experiential scores were adjusted on the basis of the combined objective and perceptual scores of the colleges. Arriving at combined total score: The total scores arrived from objective data, perception survey and experiential survey were added in the ratio of 50 per cent, 40 per cent and 10 per cent, respectively, to arrive at the total combined score. Thus, objective data contributed 1,000 marks, the perceptual survey contributed 800 marks and the experiential survey contributed 200 marks to the total combined maximum score of 2,000 marks. The total combined scores obtained by all institutes were arranged in the descending order. The college scoring the highest marks was allotted the first rank and so on. The ranking of B-schools offering one-year Executive MBA or post-graduate programme was based only on the perceptual data received from 308 recruiters and industry professionals and 83 deans/directors of colleges. Only colleges offering 11 to 15 months of Executive MBA or post-graduate programme were considered for ranking.